In short, you have to search and search, and sniff and sniff. In many cases, you have to dig up insulation in the attic or cut a hole in the wall. It can be very challenging. I have found that experience helps a great deal. When I started my career, it usually took me more than an hour to find a dead rat inside a home. But with time, I got it down to 15 minutes average. Be sure to decontaminate after you have removed the carcass, and more importantly, find out how rats got inside your house, and solve that problem! Hire one of my recommendations if you need help, or research more on this site. Need dead rat removal in your town? Click here - we service over 600 locations in all 50 states! If you think your home is superior to life in a rotted tree stump, there are many animals that will agree with you. Those little critters are waiting for the opportunity to move into your attic, crawlspace, or basement to enjoy the pleasantries manmade structures have to offer. Because of this shared living arrangement, we often find ourselves baffled by the sudden occurrence of a foul odor wafting through the house. Somewhere there lays a dead animal, and you can only make general guesses to the whereabouts based on where you detect the smell. Locating a deceased pest is not always easy—and never enjoyable—and it can be challenging if you don’t know what clues to look for. Many professional wildlife removal companies offer the additional service of finding and removing dead animals, and these folks know the subtleties of the task. If a rat has invaded your home and then died somewhere within (the precise reason poisoning is not recommended), knowing a little bit about the rat will help you locate it. Rats are large enough to leave very obvious marks of passage, and you can often find their routes of travel to places more secluded within the home. Rats can travel almost anywhere within the walls of a house, so there are some other clues you must look for first. When an animal is sick or dying, it will generally seek comfort of some sort. Most animals on the verge of death experience a drop in body temperature due to circulation draw by the internal organs. Warmth, such as the hot air provided around chimneys or above lights, will be enticing to animal whose body temperature is lowering rapidly. If the rat has a nest, there is a good chance it will be found there as well. Nests are safety zones for animals; areas where they feel secure enough to eat, sleep, and raise young. Some animals are drawn to food or moisture prior to passing, and this has to do with the mechanics of certain poisons and illnesses. Dehydration is a natural side effect of poisoning, and a rat that is feeling the effects of a toxin will be inclined to drink. They don’t always make it far enough to access a water source, but they may be found in a passage heading toward an area of plumbing. Now that you have an idea of where to look, that knowledge, combined with the general area of odor, should help you locate the rat. Air currents also play an important part in pinpointing the location of a dead rat. You may know the general area of the smell, but you’re not ready to start ripping down drywall yet to find a rat. By noticing patterns in the odor, you can help lower your search area. If the smell is strongest in the evening when your wood stove is going, it is likely that the remains of the rat are close to the stove itself. Warm air currents will make any scents of decay more potent. Similarly, if a smell is strongest when you turn on your shower or faucet, the rat is probably located near the water pipes or bathroom. Humidity increases the foul smell from a carcass. If luck is really on your side, the body will be decomposed enough to leave a brown stain on the wall or floor where the animal is hidden. Once your rat has been located and removed, the area should be thoroughly cleaned with an enzymatic cleanser. Much of the decomposition process results in an excess of fluid production, so any affected building materials will also need to be removed from the site. Wear gloves, and bag the rat carcass and throw out! 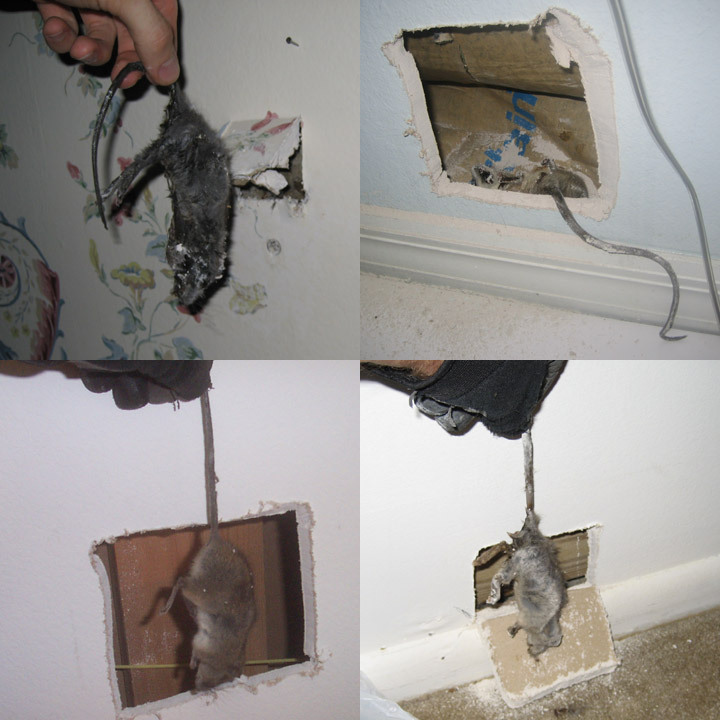 Rat smell removal from rotting rats in walls - Rats smell whether they are alive or dead, but a rotting rat carcass is the worst, particularly in the wall. Both types of odor can be difficult to get rid of, but the issue with dead rats smell is that it will remain until you can find the body and remove it. Mother Nature will, of course, eventually dry out the remains and lessen the odor within your home, but depending on the size of the animal or if multiple animals are involved, this process can take weeks to months. There is no other method of smell removal. A dead rat can be tricky to locate inside the structure of your home. Air currents will play with your perception, making smells that originate from downstairs smell like they are upstairs. Many people opt to call in a professional to locate the rat and remove it. A trained expert will know the most common locations for arts to go when they die. This person will also be able to remove the minimal amount of materials to get to the carcass. If you’re lucky enough to have hired the right professional, the company may even provide cleaning services after the animal has been removed. Cleaning is just as important as removal, and any affected areas need to be replaced or properly cleansed.